Hopefully this is removed enough to belong outside of the election thread. I'm curious how this process works, as the prospect is being talked about a lot. Let's say neither Hillary or Obama seals the deal before the convention (quite likely). We can say for the time being that Obama's lead remains as-is entering the convention, and superdelegates enter the room as presently expected. How exactly does one candidate emerge victorious? What's the process look like? Assume that Florida and Michigan are either not seated, or speculate that they are seated in a manner that does not arrive at a victor by default. If neither Hillary or Obama has enough delegates to clinch, what happens to secure the nomination? Do Superdelegates alone have the freedom to change their vote? There's a day or two of wrangling over the rules -- the chief issue, fo course, will be "do Michigan and Florida get seated." Then there's a vote. This happens at every convention, but usually everyone just votes for the nominee. Thsi time, the vote actually matters. They'll go state by state -- "The great state of Windbagia casts 43 of its votes for Senator Gravel and 57 of its votes for Representative Kucinich!" I imagine its up to each state to determine whether they want to add the usual "the next President of the United States" before the candidates' names. It's not clear to me how the superdelegates vote. My guess is they caucus with their state delegations ahead of time, so that the delegation of each state presents its totals as a whole. Superdelegates are free to change their mind at any time, so Bill Clinton could wake up on the day of the convention and decide to switch to the Obama camp. In theory. One thing that probably will occur - there will be more television coverage of this convention than there has been in the recent past. Last edited by classicman2; 03-23-08 at 07:30 PM. "Work" is the trick part of the question, isn't it? I'd say "happen" might be a better word to use. All delegates to the National Convention pledged to a presidential candidate shall in all good conscience reflect the sentiments of those who elected them. Which suggests that the pledged delegates should vote for their identified candidate, but is vague enough that there's wiggle room. It's probably moot anyway. If you're an Obama Pledged Delegate, you were selected because you strongly prefer Obama to Clinton (and vice versa). You're not going to switch arbitrarily, and certainly not on the first ballot. Isn't that largely dependent on whether or not he slept on the sofa the night before? Pledged delegates are bound to vote their candidate on the first ballot only --that is, if Pennsylvania winds up going to Senator Clinton 120 to 90, then on the first ballot, Pennsylvania must give 120 of its pledged delegates to Senator Clinton and 90 to Senator Obama. bound was the word you used. They are not bound - either legally or by convention rules. Just retract your statement, and the forum will forgive you. I reject and denounce my use of the word "bound." I agree if the Democrats want to win in November. Thanks for the info so far. Now for the question... what's it take to lock it up? Clearly a simple majority won't do? I did a little snooping. Apparently a simple majority is all that's required, and given the very small number of delegates given to any 3rd party (Edwards), it would have to be a virtual tie for Hillary to take it to a second round of voting? Apparently it means electoral votes. Which is a nonsensical way to decide a primary. In other words, let me figure out who I want to win, and then engineer a supposedly fair system that will guarantee the result I want. What kills me are all the Obama cronies saying that "Hillary can't win". Well the truth it Mr. Obama that you are likely not to "win" either. Neither of them will go to the convention with a "winning" number of delegates. But don't let that little piece of truth interrupt the landslide of hope coming down the mountain. It sould seem that looking at the entire electoral college is as stupid as looking at the popular vote. But if you only look at the states that are up for grabs... Then it makes sense. Where does that stand now? Electoral votes decide the election - not number of states or popular votes. 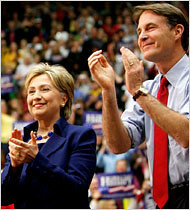 Perhaps Bayh wants a winner. Perhaps the time-honored tradition of "one man, one vote" is meaningless to him. What about primaries in which a candidate could win more votes and receive fewer delegates. Do you consider that to be honoring the 'one man, one vote' idea? Don't overlook the fact that he's talking about the Super Delegates. So far, Mrs. Clinton has won states with a total of 219 Electoral College votes, not counting Florida and Michigan, while Mr. Obama has won states with a total of 202 electoral votes. Mr. Obama, of Illinois, is ahead of Mrs. Clinton, of New York, in most other leading indicators: popular vote (by 700,000 votes out of 26 million cast, excluding caucuses and the disputed Florida and Michigan results, a difference of about 3 percent); delegates (1,622.5 compared with 1,472.5 for her, according to The New York Times’s count); and number of states (27 compared with 14 for her, excluding Florida and Michigan). The opinion polls are mixed but give Mr. Obama a slight edge. Or what about the fact that the candidate leading among Democrat voters is not leading in the Democrat primary? Should that have any bearing? *Based upon the last info I saw. So is that correct? Simple majority takes it? Last edited by Th0r S1mpson; 03-24-08 at 10:08 AM. Bayh is right. What the dems seem to be missing is that they need a candidate who can BEAT McCain, not beat the other dem. They should put the candidate who can deliver NY, CA, FL, MI, PA, OH and other large states in November. Most of the states that Obama won would NEVER go dem in November.